This morning, the Tennessee House passed HB 1840/SB1556 by a vote of 68 to 22. This unnecessary bill would allow licensed counselors in private practice to use their own religious beliefs as an excuse for terminating care or referring away clients because of moral objections to how the client identifies. Representative John Ray Clemmons (D) lead a vigorous debate on the House floor, proposing series of amendments to attempt to limit the harm of this bill and ensure the protection of youth seeking counseling for issues of bullying. One of these amendments would have forced counselors to publicly state on their website and marketing materials if they reserved the right to refuse counseling to someone. Another amendment would have prevented counselors from charging a client for services if the therapist then referred them away because of a religious refusal to serve the client. Speaking in support of these amendments, Rep. Clemmons eloquently stated that “seeking help is hard enough” and he particularly pushed for two different amendments that would protect children under the age of 18 from being refused if they sought counseling services for being bullied. The focus of therapy, Rep. Clemmons stressed, is on the needs of the client, not the counselors and those within the counseling profession understand this important focus. Extreme members of the legislature moved procedurally to limit discussion to 2 minutes per member and shot down each attempt at amendments by Rep. Clemmons and other House Democrats who stood up to fight for the rights of those seeking counseling in a state which is already underserved by mental health professionals. The bill’s sponsor, Rep. Howell (R) continued to push for the protection of the counselors at the expense of those they seek to counsel. In the end, legislators passed HB1840/SB1556 without accepting any of Rep. Clemmons amendments. This dangerous bill has already passed the Senate despite testimony at hearings opposing it and soon Governor Bill Haslam will have to decide whether to veto or sign this bill into law. This bill is just one of numerous anti-LGBT laws introduced in Tennessee this session. Several dangerous bills are still advancing in the state despite the continued fallout in the neighboring southern state of North Carolina. Already, over 120 business leaders have signed a letter demanding the repeal of North Carolina’s HB2. Conference planners have begun rescheduling their meetings to other states, the state’s federal funding could be at risk and the NCAA and NFL have both said that North Carolina could lose future sporting events if the bill is not repealed. Elected officials in Tennessee should take note of the damaging impact that passage of these types of bills could have on their state’s economy. HRC has staff on the ground in Tennessee working with our partners at Tennessee Equality Project, the ACLU of Tennessee, Tennessee Transgender Political Coalition along with the ACA to oppose this legislation. 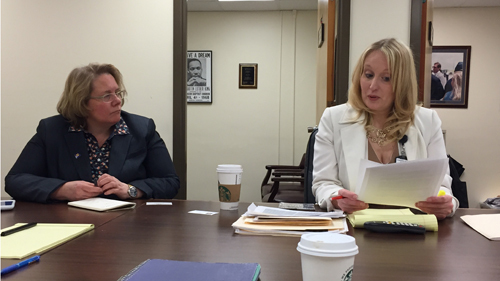 Pictured Above: HRC's JoDee Winterhof and Joe Saunders meet with Democratic staff and leadership in the House and Senate as well. 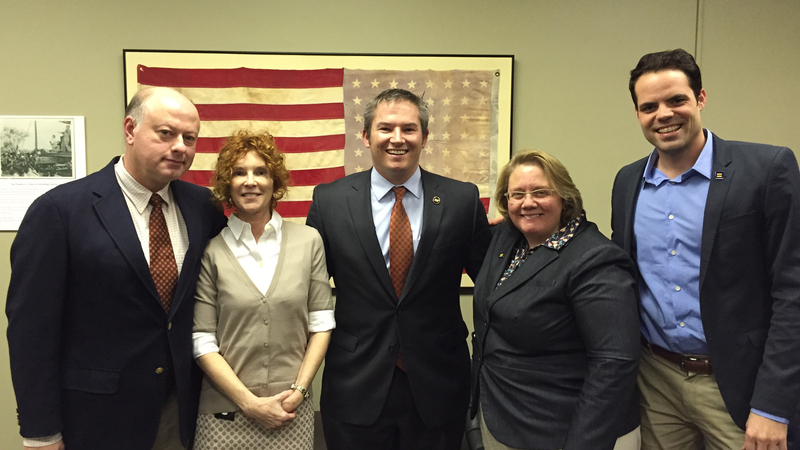 Here they are with Senate Democratic Caucus Chairman Jeff Yarbro. 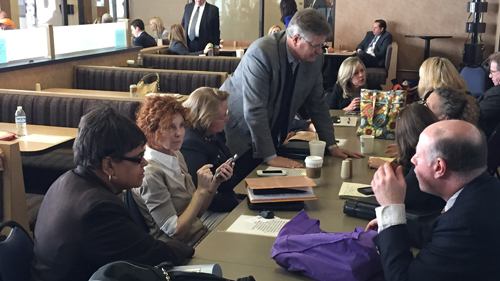 Pictured Below: JoDee with leadership from Tennessee Equality Project, Tennessee Transgender Political Caucus, ACLU Tennessee and the Nashville Convention and Visitors Bureau strategize in the Tennessee Capitol.